If you are searching for a party bus in Wanye, then your search has finally come to an end. Here at Rockstarz Limousine and Party Bus we specialize in providing our clients with an amazing time no matter the reason for the celebration. For us, creating happy clients is the most important aspect each and every single time. 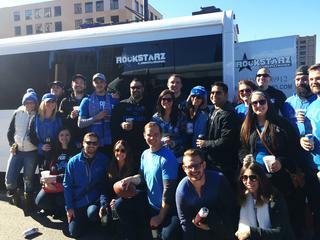 With our Wanye party bus rental option, you will find that any concerns that you may have had regarding the space and number of guests you can invite have already been dealt with. Not only have we made full use of the space on our bus, but we have also included a number of leather seats to give you and your guests a place to rest while the party continues. Our Wanye party bus service is designed to provide you and your guests with the perfect party atmosphere. That means you can enjoy the stunning start of the art sound system that is included as well as the laser light display that is designed to give you the feel of being in your own individual private nightclub. When you then consider that you are in full control of the evening, then you know you are in store for something that will create memories for some time to come. In the past, our party bus has been used for a number of different celebrations. This includes a special birthday, an anniversary, as well as a bachelor or bachelorette party. Alternatively, you may just feel like having a party with your friends for no real reason, but no matter what it may be, we can accommodate you. So, if you live in the Wanye area and are indeed searching for that party bus for your celebrations, then give us a call here at Rockstarz Limousine and Party Bus. The other option is to contact us via our website and someone from our team will be in touch.